My mom snapped this photo from the playroom over the weekend. I'd have to say its fairly reflective of our time spent here in our home as of late, and it happens to be my most recent favorite. Just hanging out with our sweet girl. I see her making her way back a little more every day, and the sounds of her laughter once again fill the rooms of our home. We lay in our bed down the hall each night and listen to her giggles as they spill out of her and when morning comes we wake to those same sounds. It is pure joy! We've had a string of four or five days where it seems as though she's feeling better and better. Yesterday we took her out with us for the first time in months and tested the waters just a little to see if her energy level would hold up. She did pretty well. We had lunch out with our parents and then went on to Hobby Lobby to do a little planning for the centerpieces for her birthday. She laughed and giggled the entire time. It was fun to have her out and about again. Her eyes were glowing as was her skin, but I think the joy she exudes takes precedent over her appearance. She continues to love riding in the car each day. We spend approximately 3 hours a day just driving with her. She asks to go all day long from early morning to the moments just before she falls asleep. She's a mess! Today will be our first look at her blood work in a while. I say a while, but in reality its only been a week or so. Compared to the multiple weekly draws we were needing a few weeks back it seems like a while. I'd like to say that I expect her blood work to be reflective of the same degree of change as her behaviour, but I know better. I'd love for her liver and kidneys to scream out "we are better, we are healing" but we know that is highly unlikely. Instead I'll concentrate on her quality of life and the good days she's been experiencing lately and do my best to ignore the ugly numbers and levels that will be posted on that lab sheet. We did draw some line cultures this morning due to some scary hours over night as she exhibited symptoms of a line infection. By this morning they had all subsided, but I still believe that there is a bug that was flushed into the blood stream last night while hooking up her TPN. It took a few hours for her to stabilize, and so I'm fairly confident in saying we will be treating some form of bug shortly. The important thing to remember is this...Ashley Kate is happy. She doesn't know or understand that her body is broken. That my dear friends is a gift. One that I will forever be grateful to her Creator for. She is not afraid. She is not scared. She simply doesn't have the ability to understand. I held our baby today. Will she ever not be our baby? I think probably not. She lay against my chest as I rocked her back and forth. The warmth of her skin, the weight of her body, the beating of her heart. I couldn't help but become overwhelmed with love for my precious girl. I hugged her tightly and held her against me. In those moments the magnitude of my greatfulness came over me and tears stung my eyes. It's not often anymore that she is content to be held, but today I knew it felt as good to her to be held as it did to me to be holding her. She was so still and so quiet. It just felt good to us both. Her legs are now so long that they dangle off my lap and her arms are long enough to wrap back around me as I hold onto her. I must have kissed her cheeks a hundred times! That sweet girl is so delicious! I could breathe her in forever and never grow tired of the smell of her hair. I love her so,so much. There was laughter today. Lots of loud,rolling laughter that filled the rooms of this home. She was feeling better than she had in days and it was evident by the sound of her joy that had returned. When I hear her laugh it stops me in my tracks and I never want to fail to be still in that moment as I try so desperately to burn the sounds of her into my heart. I never want the silence to return. It is so loud and haunting. It's the silent days, those void of her laughter, that frighten me the most. She's tired a lot. What once was only an hour or two of needed afternoon rest has spanned into six or more hours. We drive for two or three hours at a time and I watch her eyes sparkle in my rear view mirror. She is quiet but happy. It's her eyes that have always told her story. Happy or sad... I can read her eyes. As we drive they tell me how happy she is to be watching the world go by her window. On her stronger days she dictates which direction we turn and what shed like to drive by next. I would be hard pressed to make a guess at the number of miles we have traveled around town this last two weeks. I can hear her laughing right now. She's down the hall from me and she and my mom are making memories together. Treasured moments that I know neither my mom or I would ever trade. I'm not sure what all secrets they share with each other after I have gone to bed, but I'm so blessed as I listen to the giggling that floats down the hall. I'll hold onto these moments for the rest of my life. We are living some very precious days in our home right now. Memories to cover up a little of the hurt that we are all trying so desperately to bare. Ashley Kate's 8th birthday celebration. I need to get it out there for our family to be able to schedule the weekend on their calendars. With Blake's summer schedule and all his travel we've finally settled on this date with hopes that he will be home from his national tournament in New Mexico in time. He has a 55 game schedule to be played over 60 days this summer! I'm so excited for him, but that leaves us just 5 weeks to get everything built, painted, assembled, and ready to party before we leave on June 1. I chose the theme the day after her party last year, and so I've had lots of time to dream, plan, and organize my ideas. I've settled on the invitation design, the venue, and the basic layout of the room. Yes, I said room...you did not read that incorrectly:) for the first time in years we will be having her birthday party indoors out of the August heat. I KNOW this will thrill my family who aren't fans of the Texas summer. The venue was so graciously offered to us a couple of weeks ago and we are so excited to be hosting our family and friends in an air conditioned space. I know it may sound silly to some who just don't see why we celebrate Ash's years the way we choose to, but we need this. I learned years ago that her life is a gift. Every breath, every moment, every day is nothing short of miraculous and now more than ever do we need this distraction...this celebration...this event. It keeps me going. I have a date, a goal, a something to accomplish and I get up each day and work toward getting her through this date on the calendar. Plan to join us as we take a trip to the Emerald City and look for that land that lies Somewhere Over the Rainbow. I hear its a fabulous place for a party! Its 3:30 a.m. and I'm wide awake with a thousand little things running through my head. Ashley Kate is sleeping peacefully and my mom is fast asleep across from her in the spare bed. I peek into her room and I see her sweet face in the soft glow of the light from the stars that illuminate across the ceiling. I stare at my girl and think to myself that she's safe at home all tucked into her bed, but yet I know in my heart that she's not really safe at all. Its the knowledge of this that keeps me awake night after night. She's not safe. She's not safe anywhere. She will never be safe again. Her body is broken and the illusion I see before me, although she feels safe in our home, and although I feel safe because she is still here, is a lie. The truth is that no matter where she is...our home...her bed...my arms...a hospital unit...Ashley Kate is not safe. Her body is breaking down and there is nothing I can do to keep it from happening. Stupid liver! Stupid kidneys! I'm so angry. We've had some hard days lately. Her body has been tired and sickly. She has felt really awful. It seems like we have a couple of good days full of smiles and giggles only to be followed by 4 or 5 hard days. On the hard days she doesn't smile...doesn't move...doesn't play...doesn't get out of bed...doesn't open her eyes for more that a few minutes. I feel paralyzed by whats happening to her on those days. I struggle to smile...to move...to function...to get out of bed...to open my eyes. I'm exhausted. More mentally than physically. I can sit in a room and not say a word for hours on end. Its too hard to speak. I don't want to talk. To anyone. About anything. I don't have it in me anymore. I fight this battle and do my best to win it while the kids are home. While they are gone to school though I sit and I stare on her harder days. My mom doesn't ask me to talk...Dave doesn't push...they just allow me to be what I am in those moments and I need that from them. I need to work this out without being told how I should be feeling or acting or thinking. But then...on the good days...she smiles...and giggles...and plays... and my heart leaps for joy as I watch my sweet girl return to who I know she is and what I know her life can be. Tears roll down my cheeks as I see her mischievous grin spread across her face while she pulls apart the race track for the hundredth time and then pretends to be sad as she tells me "its broke" and hands the pieces to me to fix it...again. She giggles with delight as she signs "ball" and points to the ceiling fan. She wants us to toss the beach balls into the blades of the fan and send them sailing across the room. I say "remember" and the giggles and the gleam in her eye are abundant as I then say "grandma...she threw the ball...and she BROKE the fan!" To which my sweet Ashley signs, "please, please, please "through her giggles. Oh, my girl! The things that bring her so much joy. So we throw the ball into the fan, knowing we could break it again, and knowing we probably shouldn't, but not caring because of the joy it brings and the laughter it spreads through the room. I'd break a thousand fan blades if it would keep her smiling for just another day. I'm wide awake for, well, I've lost count how many nights its been now that I lay wide awake in my bed with those thousand little things on my mind. I lay there and think of the craziest things. I think how much I'd love to grab these precious people in my world and run. Run far away to where we could all escape the craziness of our world right now. I'd love to sit by the ocean with my kids and my husband and listen to the waves roll in as I allowed the sounds to wash over my soul. I'd love to hold my baby in the stillness of the night against my chest and wait for the sun to rise again. I'd love to hold Dave's hand, and listen to the laughter spill out of my kids, and watch them all be carefree for just a few more days. If I could I would do all of this and more. I'd run and I'd hide and I'd escape the horror of what lies ahead. I would. Instead, I lay here in the middle of the night and feel the puddle of tears on my pillow as I search for answers and solutions inside of my soul. I pray for stability, pray that her liver and her kidneys will maintain. I'm not asking for healing, I'm just hoping for things not to get worse. Not to deteriorate. If she could just stay the way she is now, not experience anymore decline, not get sicker, not suffer. Those are my prayers. Just allow her to be who she is now and not lose the quality that she has. If a picture was ever truly worth a thousand words then I would say this is the one. If you look closely in the upper right image you will see the ball in the air right after she threw it. I could write a novel about the way God has used this silly game of baseball and my son's passion for it in the life of our family, and especially in the life of our youngest daughter...but I won't. There are some things I choose to hold in my heart and for now this is just one of those things. The emotions are so strong I really can't find words to even share if I chose too. Instead I decided to leave you with a few of the many images we captured the other night. The boy that chases his dream and inspires me to keep giving it my all even on the days I feel as though I can't go on. Oh, how he loves this game and his little sister! This is my VERY favorite of them all. I don't know why, but there is something about it that draws me back to it again and again. The flag...the coach handing Ashley Kate the ball to keep...my son, oh how I LOVE this kid...my baby...her daddy...the umpire...the field. In my opinion it captures it all. Every single piece of that night all together in one single image. It was a moment that will live in our hearts forever. There is a video. Its not great quality and I'm not sure how to add it here, but I'm working on it. Maybe it will be up in the next day or two. One more game away from clinching the District Championship! Win or lose we will come out with the title either solely or co-champions. I'm so proud of this team and so blessed Blake has had the opportunity to be a part of it. There are moments in her life that I would't trade for anything. There are moments in her life that have made every struggle, every fight, and every battle worth the courage it took to make it through them. There are moments in her life that have made memories that still burn so brightly in ours minds, that we hold so precious in our hearts, and that are so priceless that we still struggle to find words to describe them. Tonight our family will all experience another one of those moments. A moment that brought tears to my eyes instantly when asked if she would have the strength to participate. I was unable to answer as I fought back the emotion and had to look to Dave to do the talking. I know we both have struggled to keep from crying each day this week as the time approaches. It means that much to us. To our son. To our family. 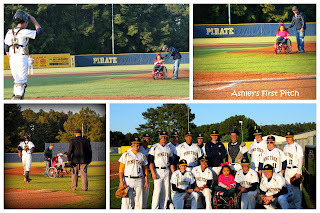 Our sweet Ashley Kate has been going to the ballpark for most of her short life. I remember holding my tiny, 10lb, one year old baby girl in my arms when Blake hit his very first home run. She was there with us...with him...with our sweet friends, with our beloved Tarheels. Ash was there the night Blake stepped onto the Field of Dreams for the time his freshman year. She was there the night he started his first high school game from behind the plate. She was there for the first trip to the playoffs...for the second...and how we hope she will be strong enough to make it for the third year in a row. 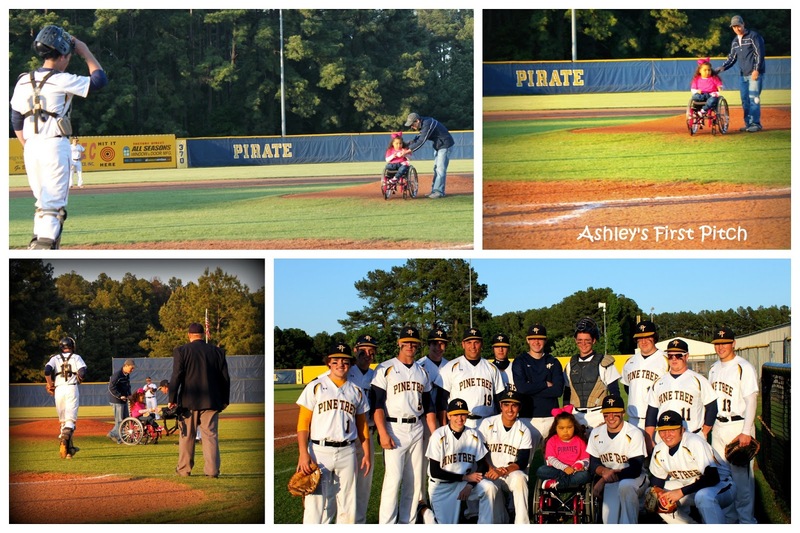 Tonight our sweet Ashley will be throwing the first pitch of the game to her big brother. Its the last home game of the season for our Pirates this year and they currently sit in first place, just two games away from winning a District Championship. I'm a little nervous for our friends to see her. More nervous for the strangers who will be in attendance knowing there will be confused looks and stares as her tiny, yellowed body takes the field in her chair. She's not nearly as strong as she was a few weeks ago and we know the ball won't make it more than a foot or two, but the significance of having her there tonight, throwing the ball to her big brother, knowing she's battled back yet again. is so very huge for all of us. Just one more high five from her big brother through the fence. Its what I was determined to give to her a week ago, determined to allow him to have again, even it was just one more time. I'm grateful. So very grateful. She's his biggest fan. She's a loyal Pirate Baseball supporter. She's a fighter. She's a champion. There are moments I wouldn't trade the whole world for, and as Dave and I attempt to hold back our tears, we will be living another one of those moments with our kids tonight. Thank you Kristi for giving this gift to all of us. You will simply never know the magnitude of it all. Allison Brooke...cheer banquet...freshman year...I think she's stunning! Just a few of my favorites from the last few days. I love them more and more each and every day. They are the most amazing people I've ever known. Lucky me...I get to be there mom. God is good. ... none of this would be happening. Ashley held her own water cup today. It was the first time I've seen her have the strength to do that in over a month. She laughed today. She cheered. She was happy. We had a few of those days with her last week, but then...she got tired...or so it seemed. She spent most of yesterday asleep. We sat out on the patio with her for hours Friday afternoon. It was such a sweet time. She played and we watched. Taking the time to just enjoy those moments with her out there was the best thing I did all day. Yesterday we planted the gardens out front. She sat in her chair and watched as we all worked. She laughed. She giggled. She clapped. I grabbed my camera and sat under a tree... I stared at her...at Dave...at Blake...at Allie. I wouldn't trade those images of her with them, the dirt, the flowers, the everything for anything in this world. Today we drove. A lot. We drove to the restaurant in town that has a large metal rooster standing out in front of it. Its her favorite! Not the food...the rooster. She asks to go there every single day and once we are there she asks us to take a picture of her rooster...so...we do. I've been to see that rooster at least a dozen times in the last 3 days. She never grows tired of waving to him. I don't think I'll ever grow tired of taking her to see him. Before bed tonight, after her bath, while being tucked in she asked to go see him...again...so I loaded her in the car and the two of us went back...to the rooster. Just she and I. We sat in front of him for a long while. I tried not to cry. I've been trying not to cry for what seems like forever. Every day I'm fighting the urge to let the tears spill out of my eyes. I don't want to spend my days crying. I'm sure I'll have plenty of those in my future. Still, I feel every single day as though I'm going to fall apart. That stupid rooster makes me cry almost every day. I don't know why. Tomorrow will be our first glimpse at a lab sheet in over a week. I'm dreading it. I can tell you by the color of her skin and the look of her eyes that the news won't be encouraging. So...if I can avoid talking...and writing...and sharing...then maybe all of this nonsense in her body will just stop happening...Seriously, the burden I feel is crushing me. I struggle to move each day. There are things I have to do and yet if I could stay locked away inside of our home with her forever and never, ever have to leave it again I think I would be ok with that. Some days its just that hard. It really is. I guess I can't avoid that. Often times I have wondered why God has led me down different paths in my life. My husband is in the military, so this means we have ended up in situations which are different than we've planned. We have met many different families and have a collection of friends in various places around the world. We were stationed in Nebraska at the same time that Ashley was there in rejection. I had the privilege of meeting Trish and Ashley, and we became fast friends. I spent many hours with her up in the PICU at UNMC while Ashley went through various treatments and surgeries. I saw her interact with doctors and nurses daily. I witnessed her parent her older children from a distance, and I tried not to eavesdrop as she shared conversations with her husband from a cell phone. During these months, I learned some life lessons. I saw the true, unconditional love that a mother has for her child. The kind of love that would sacrifice everything for the life and safety of one, but the battle that raged internally as she wished she could be with her other children. I learned that Dave and Trish are the real deal. They are not blogging fluff. They believe what they write and they live it. But one of the biggest lessons was a surprise to me... I believed that in being there, in being a part of their life, I was being a friend to Trish; my presence in those moments with them was helping them. I never expected those moments to change my life. Since Nebraska, we are now stationed in Louisiana, just a short one hour drive from the Adams' family. I do not believe it to be coincidence how God orchestrated us to meet hundreds of miles away from where we now both live. I know God planned for our paths to cross. Trish is one of my dearest friends. When I have had my own life issues, she has stepped up. She has walked through my struggles and prayed through family emergencies with me. She has encouraged me and loved me. They have truly been a support to our family in return. I could continue about what I have gleaned from my relationship with this family, but I believe that anyone that has been touched by them, even just through the blog, has their own story of how the Adams' family has impacted their life. I am blessed to be the mother of three children. All, for the most part, healthy. If you say the name Ashley (or Allie, Blake, Ms. Trish or Mr. Dave), my children light up. My family loves them all. I have always found it amazing that my children (who do not know sign language) have never struggled to communicate with Ashley. It is like they have a universal language. They just understand each other. When I asked Trish if I could facilitate a fundraiser, I approached expecting a denial. They ask for nothing of anyone. They willingly share their story with all of us, with overwhelming support, but sometimes with criticism from strangers. I believed she would say 'no,' so I chose a t-shirt, so that it could be a way for us to show our support as well. My oldest daughter (12 year old), Katie, found out the plan and asked if she could be involved. She jumped on the ipad and immediately designed a rough draft of the t-shirt design. I sent it to Trish, who in standard form, loved it, especially because it was designed by Katie. The company I work for has graciously donated the shirts at cost, because they too are touched by Ashley Kate's story. The shirts are available to order until Wednesday, 4/17/13. Send your paypal email address to crkbaird@earthlink.net, along with sizes wanted. The 100% pre-shrunk cotton shirts cost $10/youth (S-XL) and $15/adult (S-3XL) and run true to size. I will then send you an invoice for the shirts ordered and shipping. The shirts will then be mailed to the shipping address notated through paypal. Any questions should be directed to me (crkbaird@earthlink.net), and I will answer as promptly as possible. I will do all the invoicing at once, so there may be a delay. I am so thankful to God for you all. I am thankful He has chosen us to play a small role in Ashley's story. Each day we watch as Ash's body gets just a little bit stronger than the last. She's making progress. Its slow, but steady. The little things I've noticed are things like: turning the light switches off for me as we leave a room, Sitting on the edge of her bed a little longer each day, Laying herself back on her pillows and covering herself with a blanket, Holding her Ipad in one hand again, reaching for objects in front of her, etc. She has yet to begin moving on her own, but I think it may just be a matter of a little more time before she does. Yesterday was the first day in 3 weeks that she left the bed. I asked her if she would like to go into the play room and she told me, "no, no, no". I didn't listen. I feel like I need to push her just a little bit each day and she'd been in bed for 21 days in a row. I promised her she didn't have to play, but told her I would like for her to get out of her bed. At first she looked confused, unhappy, and maybe a little frightened, but it didn't take long for her to settle in for the afternoon. She didn't ask to play with anything, but she did point to a few different items and showed some interest. She stayed in the playroom for the rest of the day, even napping in there for the afternoon. Last night she began to play just a little with her farm animals and even though the energy and excitement I'm used to seeing from her wasn't there, we were encouraged by her play. By bedtime she was totally exhausted and worn out. Basic cares wear her out. We changed dressings last night and will shampoo her tonight. I'm trying to stretch out what I would normally have done all at the same time so she doesn't get too tired. Its going to take a little while for her to get strong again. Her body took a massive insult with this last infection and her muscles became weak. She tires easily from activity, but I don't think this will be forever. Its only a temporary setback. I'm seeing more life, and more activity in her eyes every single day. She laughs a little bit more each day and we have seen several smiles throughout our interactions with her. She is tiny and frail in comparison to what she had been, but her spirit is so, so sweet. We take her on her drives each evening and she seems most happy when the world is passing by her window. We hear more laughter and more joy from her in these moments than most others. She loves to be on the go. This afternoon we opened up the doors to the house and allowed the smells and the sounds of the rain to come in. She didn't want to go out in it, but was content enough to listen to the sounds from the playroom. I'll know she's really feeling better when she starts requesting to go back out into it. Rain is one of her very favorite things. Its taken a few days ,but I think I'm finally feeling rested and renewed. Last week was brutal. Emotionally, physically, and spiritually. It was just so hard. I don't have words to even describe how exhausting the emotional drain on my heart has been. This time at home has been good for both Ash and myself. She needed to come home, and I needed to bring her home. I can feel the relieving of burdens on the hearts of the kids. The big picture hasn't changed, but our today is easier to manage from inside our home where we all begin and end the days together. I did have a short conversation with transplant this afternoon, but nothing serious was discussed. They were just touching base, checking on her, and letting us know they were there if and when we were ready to take her back to Omaha. Honestly, I'm not ready to think about or discuss anything yet. We need some time at home to adjust to all the new information we were bombarded with last week. Long talks, weighing pros and cons, and looking at all sides of the decision are in our near future, but not today. We just can't go there again today. I want to thank each of you for praying for Ashley Kate and for our family. I am so humbled by your words of encouragement and so appreciative of the time you spend here with us. I simply don't have the ability to express how very much you all mean to us. Several people have asked or emailed me about the new t-shirts that are being designed for Ash. The design was created by one of Ashley's friends. I love it! If you are interested you can order them by emailing Rachel at crkbaird@earthlink.net. She will be happy to help you get one. Ash is settling back in at home this weekend and as she settles we've begun to hear her giggle again. What joy she has inside her broken body! We endured 18 long days without the sounds of her laughter and I knew that the day it returned would be the day she began to make her come back. Ashley Kate is very weak. Her body has been through an incredible illness over that last 2 1/2 weeks and it is taking her some time to get her strength back. She spent all of yesterday in her bed and she slept for most of it. She is requiring a lot of rest. She is not able to sit herself up anymore and she had not been able to lay herself down either. Today we did see her lay down on her own and so imagine it will be just a matter of days until she is able to sit up as well. She was awake more today than I have seen her in weeks. All good signs of recovery. This morning she woke around 7:30 and the first thing she did was ask to go for a drive. My heart smiled. Inside a hospital room she would have been denied the opportunity to take a drive. Inside our home we are able to load her into the car and drive for as long as her little heart desires. It was along this drive that the sounds of her giggle were heard. Joy that could not be contained...even in her tired and weak body...her joy was heard, the giggle returned. We are treating her for several different things right now. Most seriously is the yeast in her line. We purchased 15 doses in order to get her out of the hospital otherwise she would have been required to stay inpatient for another two weeks. I would have to say...SO WORTH IT...just to have her back home. She's happy. She feels safe. She's comfortable. I'd figure out how to pay it again and again and again if need be. I'm hoping this will clear it, but if not...we will figure it out. We are also starting her on two injections each week to help her produce her own blood again. Her kidneys are no longer producing the hormone that is needed for the bone marrow to make blood. It is assumed this has been the reason for the recent changes in her blood volume and the need for such frequent transfusions. We really need this to work because the constant need for blood is causing large levels of iron to be stored in her liver and other parts of her body and adding to its struggle. Its easy enough to give blood transfusions...its not so easy to rid the extra iron that is coming along with it. In addition to these new changes we are starting her on a new medication to try and help control the severe itching she is experiencing from the high level of bilirubin in her blood. She has several serious wounds we are dressing as a result of this itching. She is clawing her self and making wounds. She has them on both of her feet, on her thigh, and on her abdomen at the bottom of her transplant scar. I am hopeful we can make her more comfortable in this area. The clawing is severe. So...life is a little different than it has been. My mom has come to stay with us and to allow me to still be involved with everything Blake and Allie are doing. Ash isn't able to be on the go at this time and so this will be a huge blessing to us. I've spent today resting. I think the emotional burden of the past week finally caught up with me. I'm weary. I really am. There are so many decisions to be made, and plans to put into place. Dave and I have much to discuss and we are trying to figure out how to best have these hard discussions with the kids. For now I can see the relief on their faces and hear the lightness that has returned in their voices simply because she is home. I don't want to take that from them again. I don't want them to feel the heavy burden that they carried all of last week ever again or at least for a very long time. It breaks my heart knowing how worried they were. Most importantly though...we are hearing her giggle again...for that we are more than grateful. We may not always see, or understand, or even agree with what is happening around us, but I've seen it time and time again...the Father is directing our path. I can remember so very well the hurt and confusion that surrounded us the night our sweet Ashley came into our lives. We stood in the hall of that hospital and couldn't believe what was being done. It made no sense to us at the time and the tears I shed with my heart broken didn't stop for days. It didn't take long to see that God was truly taking us down the path we were meant to go. He gently picked us up and changed our direction in order to bring about the best for or life with Ashley Kate. I can see that now. I can see that so clearly. Monday morning we believed we would be taking Ash to the hospital in Shreveport, like we've done many, many, many times. We had a path set. We thought. Then with each passing hour as we sat in the ER we learned that things were not going to go the way we planned. It was so confusing. We were stunned. We were frustrated. We were so confused. We simply didn't understand and couldn't believe what was happening. Just like before, it didn't take us long to see that God had orchestrated a better plan for us. The path He had in mind took us in the opposite direction. Clearly, looking back we know His plan was so much better for us than the one we had. We were sent by ambulance to Dallas instead of Shreveport, and I'm so grateful that we were. I know without a doubt had we gone with or plan that my sweet Ashley would open her eyes this morning in a hospital room in Omaha. Instead, she will open her precious eyes in her room and she will be surrounded by all she knows and loves. His path was better. It always is. Even when the tears and the confusion cloud my eyes and it takes me some time to see what He's doing. Its always better. We brought Ashley Kate home in the early morning hours. By 3am she was tucked in her own bed. As we pulled onto our street you could hear the sweetest little cheer come out of her. She helped her little hand and she cheered. Precious, precious girl. She loves to be home. I didn't post much yesterday and I realize that, but the words failed to come to me. My conference with the pallative care team was one of the most difficult things I've ever experienced. I had resolved in my mind that I was going to stay calm. I was not going to get emotional. I was not going to cry. It was simply a discussion, not a plan. We were just getting information to help us make a plan. How are you supposed to talk about and plan for end of life care for your 7 year old? It was not happening. I thought I would be swallowed up by my grief. It came tumbling out of me at one point and the raw pain that I have been trying so hard to suppress for years ripped through my heart. It hurt so bad just to say the words, "I know she's going to die." I've known that this is more than likely our truth, but sitting across from strangers and having to say it out loud stole the breath right out of my lungs. I felt the room spin around me and there wasn't enough oxygen left for me to breathe. Writing about it and hearing the words come out of my mouth are two totally different things. They are not the same. I've spent many nights writing and allowing the tears to flow down my face in the stillness, and the quietness, and the dark of my bedroom. This was different. The sun was shining in through the windows and my sweet Ashley was lying quietly just a few feet away from where I was sitting, and across from me were two of the kindest people I've ever met. This was so different than my private grief. This was out in the open, and it hurt so badly. Looking back at it this morning all I can say is this, I hope that God once again has a plan for us. I hope that He will be able to direct us and place us on the path that is His very best for our family and for our sweet Ashley. I can tell you now that when it comes down to the end I know I'm going to panic and I'm going to fight for every breath I can for my sweet girl, and I simply can not see or understand how His plan could be different than the one I want for her. Its going to take time, and He is going to have to do a mighty work inside of me to get me to the place where I can look back and say...He was still directing our path. But...for today...my precious little girl is here...she is home...and she is not going anywhere. I do not know the plan He has for. I do not know the number of days or weeks or months or years He will give to her. I just know that for today she's still mine and the path led her back home this time. Praise God for that. She came home again. Ash initially woke this morning in a very foul mood. She didn't want to be touched by anybody! I don't blame her though. I don't really like strangers pulling back my blankets right after the sun rises either! Once she was fully awake, the grumpiness didn't cease too much, but now she is sitting up in her bed and looking much better than she has in 16 days. She is signing "bye-bye" and "thank you" to the staff and although I know its ultimately her way of saying "get out" they think she's being sweet. I, on the other hand, KNOW my girl and her attitude and she's figured out that when she wants them to be done talking and to leave the room all she's got to do is say "ummm, thanks and see you later!" You just gotta love Ash! So I truly believe that the acute illness from this infection is subsiding and that is good news. With the decrease in swelling, tenderness, breathing struggles, and lethargy she is getting better. The problems within the bowel as settling themselves out, and I am SO thankful for this team and their willingness to be thorough and specific with all the tests which ultimately gave it time to work itself out before operating on her. I can only imagine how horrible this would have been had they opened up her abdominal cavity. She still has a long way to go, but the changes in her behaviour are very encouraging. When I sat her up this morning the first thing she did was point to her wheelchair, sign "car, go, now". I know she's feeling better because she's done with being in this bed. She is still very weak and sleeps for hours and hours (like 4-5) between each episode of sitting up for 20-30 minutes. I think its going to take a while for her to build her strength and stamina back up. Ash is on an anti fungal IV treatment for this yeast infection. It looks like insurance won't be covering it outpatient and the daily bill for it will be $110.00. Ouch! She is on it for a minimum of 14 days. Its gonna get interesting. I'm going to see if they have anything similar to it that will be as effective. Its crazy that the insurance will cover the cost of the medication inside the hospital while running up the bill higher and higher but won't cover it at home where we aren't billing thousands of dollars a day to sit in the bed. I'll never understand insurance. The overall picture of Ashley's decline and disease progression has not changed even though we are transitioning to home in the next couple of days. Her liver is still failing, her loss of kidney function will remain, her spleen continues to eat up her red blood cells and swell. Life is not going to get easier for her. Instead it will more than likely begin to get a little bit harder each day, but we are seeing signs of her quality of life returning after this current illness. I have a conference this afternoon with the pallative care team just to get an understanding of how it works. It doesn't mean that we have made a decision about re-transplantation yet. It just means I am trying to look at all options and both sides of it all. I'm hoping I can get through this without falling apart. Thank you so very much for your prayers. I'm feeling stronger today than I have in a while. She is working hard at feeling better. We have avoided an invasive surgery that Monday we were told she had to have. God is working in this situation and I know you all have been praying. I appreciate you all so very much. This has been a long, hard, journey, but so many of you faithfully walk along side us year after year. I am so humbled by your presence here with us. In my weakest moments I can almost feel as though I am being held and surrounded by " a cloud of witnesses" and the image it brings me is so very comforting. I'll forever be grateful. She takes my breath away and has every day of her life. Oh, how I love you sweet girl. I'm so sorry for the delay in posting today. I'm so, so tired. I'm tired of thinking... tired of hearing...tired of trying to learn so many new things so fast...tired of hurting. I wan't to start by sharing some of the good things that have happened. There are so many bad things going on in her body, but I'm starting to see some good things take place in her current condition too. 1.The massive swelling of her entire body is going down and she is returning closer to her normal weight. 2. She is able to stretch out her legs and rest completely as opposed to keeping them drawn up so tight trying to minimize the pain in her abdomen. 3. Her breathing has begun to settle and she is much more peaceful than she has been for the last few days. 4. She is able to remain sitting up for a period of about 20 minutes and interact with us. Asking for drinks, picking out a movie, or playing on her I pad. She hasn't wanted to touch her I pad for over a week. 5. We saw her smile briefly at something she saw on the TV. It was short, but so very sweet. I've missed her smile and her laughter more than anything this last two weeks. 6. She was bossy and grumpy all day long today. It was good to see her so irritated after watching her be so un interested for days. 7. A final determination was made today that we will not be taking her into surgery to operate on the bowel! 8. The team is now trying to figure out how to get us home with her. Its going to be a little messy, but I think it can be done. They began working on the possibility today. These are the happy things that have taken place in her room today. Small steps, but still steps. Overall, Ashley's baseline status is very different than what it was two weeks ago. I hope with everything in me that we can get her back to where she was then, but it may not ever happen. I'm trying to prepare for that. Ashley has a yeast from her gut, the small portion that is left, that has found its way into her central line. Yeast is bad. Its one of the very worst infections a central line patient can get. The only way to rid her of it completely is to pull out the line. This team would like to do a mapping of her veinous system to see if they can find anything patent left, but its too dangerous to put Ashley on the vent at this time. Her body is so weak and she may not have the strength to be taken off of it in addition to the risks of intubation period. They settled on viewing the images and reading the reports done in Omaha back in 2010. There is simply not anything we can do about this other than treat her with the anti fungal and hope that some day it will clear. It is my understanding that they are having a hard time believing there is nothing left to work with because they are told all the time that this child or that child is out of central line access and its not quite the case, but unfortunately it is with Ash. Unless a miracle takes place inside of her body and I'm not convinced that when the time comes that it won't. I'm just holding on to that piece of hope for myself. She is a living, breathing miracle so I know they still take place. An echo cardiogram was done late this afternoon to look at the heart valves and determine whether or not yeast has made its way there too. I have not seen the results and probably will not know anything until tomorrow. Its very, very important that those valves remain clear of the yeast. We have talked with hematology and they are doing a work up on Ashley and trying to help us manage her need for hemoglobin. The kidney team has started her on some new IV medications that I will be giving her twice a week from now on. Nothing can be done to restore the loss of function in her kidneys and we don't know that we can stop them from declining further but we are going to try in an attempt to keep her from needing dialysis in the future. Her kidney function, or lack there of has been one of the more surprising pieces of information we've learned of. Its something we knew would begin to happen at some point, but I guess we didn't realize it had already begun and the severity of it is more than I would have guessed. Early this morning I spoke with the surgeon in length and his overall assessment of Ashley Kate and her condition is that it would not end well if ever she needed to be opened up again. It was a hard conversation because I know that our only hope of saving her life would be to open her up for transplant and yet it has a very high probability of taking her from us. What could save her would ultimately kill her. How are we to choose? I want desperately to take Ashley home and care for her there. Its so hard to be separated from Dave and the kids during this time. They need to be near her and she needs to be near them too. I truly believe it is in her best interest to get her back home as soon as we safely can. We are still being forced to make the hardest decision of our lives. I can honestly say that Dave and I do not know what to do at this time. We are at a loss. Either way I believe we will lose our sweet Ashley and the thought of that is making me physically ill. There is no way to win for us. Our precious, tiny, gherkin is going to hurt and suffer and struggle no matter what we choose. The prediction made by the transplant surgeon two years ago this July is going to come true, "Ashley will not grow up. She will not survive long enough to be given the opportunity." I wanted so desperately to prove him wrong, and yet he was right. The repeat blood culture again grew out yeast from one of Ashley's lumens and I had been so desparately hoping the first one had somehow been just a contaminate. Unfortunately, at 4 am I was told the news...my heart sank. Yeast is an infection she has never had in the line and its an infection that short of pulling it out may never clear. We all know that pulling this line is not an option for us and so we will treat through the infection. She will remain on an anti fungal indefinitely until a negative culture can be drawn. I'm so afraid of how that will affect her chances of ever being allowed to go home again. My heart can't bare the thought of her spending day after day after day inside the four walls of a hospital room. Ashley needs to live. She needs to have the opportunity to go for her drives in the car. She needs to feel the sun and the breeze and the rain all against her skin. She needs to have the chance to listen to the ball come off the bat and to hear the cheers of the crowd and the sounds of her friends running past her with their giggles. Even if only from the inside of the car. It brings her so much joy to be in the world and not kept from it. My mind is full of all the things there is left for her to do. She has so much living to pack into whatever time God allows her to have. She can't do any of that from in here. She has to go home so that she can keep living. I'm remembering the JOY she experienced at the Splash Park last summer and the smiles on her face as the water "rained" down all over her. I dare say there wasn't a child who enjoyed it more than Ash in the whole park. We are so looking forward to taking her back to be rained on as soon as its warm enough. She's got things she wants to do. The NP came in tonight and we began to talk about the way we take care of Ash and how we allow her to live outside of the hospital. We talked about how blessed we are to be able to accomplish all of these things for Ashley Kate and how desparate I am to figure out how to keep on keeping on. I don't want for anything to change for her just because we are now forced to stare into the face of all that is taking place in her body. Make no mistake, we knew these things would eventually happen. Dave and I have always known that we would be powerless to stop any of it. What we do have power over though is how we choose to allow her to live through it. We discussed the differences between pallative care and hospice care and how we might need to begin seeking out a pallative care team to help us accomplish what we wish for Ash's life. We at least need to be thinking about it. These are discussions you never imagine having to have when talking about your 7 year old baby. Hard, hard stuff. Emotional. Heartbreaking. All I could say through my tears was "she is such a great kid. she's so amazing." Its so hard for me to even imagine a day coming that she would no longer be in. I washed her hair tonight and I sat behind her on the bed as I brushed it out. I love her hair. I really, really do. I don't know how long I sat there pulling the brush through it and listening to her breathe. Its a beautiful sound. Have you ever just sat and concentrated on the sound of your daugther's own breaths filling her lungs? There is peace found in that sound. There is hope found in that sound. There is something so soothing...so comforting...so healing...to be found in that sound. I still hope for so much. There is hope to be found. I have not given up and I do not believe that this is the end. I think it may be the end for some things and the beginning of some very scary things, but there is still time to do so much. I believe that there is time. One of the hardest parts of all of this is knowing that the hearts of the two most precious people in my world are going to be broken. When I cry in the dark its over the pain that my big kids are going to experience inside of their hearts. They both text me all day long checking on their baby sister. I hear the resolve in Blake's voice to get something done. He wants answers and solutions. Thats my son! Take care of what needs to be taken care of and bring her home. Oh, how I love the fierceness of his love for Ash! My beautiful Allie sent me a text asking me if Ash was going to die. Between her second and third period this is what her mind was consumed with. As she sits in class day after day she is wondering if the little sister she begged for and waited for and prayed for is coming home again. Its almost too much for this momma's heart to bare. I told her not today. I told her we were all dying at some point. She, and I, and Ash, and everyone she knows would die at some point. None of us know when that day will be and that I didn't want her to worry. I assured her I would be honest and tell her what I knew when I knew it. How my heart was breaking. What do you say to your children about days like today? Do you tell them that her body is getting tired? That she won't be able to keep going forever? That the day is coming when her heart will stop beating because the body she was born with has never worked? Its different now than when they were little. My kids have grown up and they want answers. They want answers to questions that make my heart stop when they ask them. I spent most of yesterday feeling like I was being punched in the gut repeatedly as every single discipline came into her room sharing what they knew. Do I inflict the same pain upon the children I have spent my life protecting? There is no training for times like this. When I became their mom I never knew that this would be included in the job. Breaking their hearts is destroying me. I don't think you can ever properly prepare for these conversations. Again, I want to remind everyone of this, Ash is not dying today. At least barring any major turn of events, she is not expected to die at this time. What is happening though are the things that will bring about her death are coming to the forefront of our discussions. We are being forced to stare into the face of the reality that up until now we had only had to know was one day coming. Things are changing in our world, but the end of it is not happening today. Its just getting harder. Thank you so much for loving our girl. I simply can never repay you for loving her the way that you all do. My heart is so humbled by the words you write, the encouragement you send, the prayers you whisper. My plan is to bring her home as soon as we can, to make her days count as much as possible, and to love on my people as we begin this leg of her journey. Before you know it you will be seeing my 7 year old beauty on the other side of the fence cheering for the Pirates and that amazing #10. We will be back out there. I don't even know at what place to begin. The information is coming at us almost quicker than I am able to process. I have thousands of things running through my mind, and questions tumbling out of me with each and every consultation that enters our room. We've seen so many different doctors in so many different specialties that I seriously could not repeat one single name by memory. There is so much going on inside of Ash. I think the best way to get it all out there without writing until I'm weary is maybe to list it all, but not go into detail about each. I look into the eyes of my baby and I see her. I don't see the list. I see her. She is alive. She is fighting back. She is spunky, and irritated, and adamant that she is going home. In the moments that she is awake she is running this show and letting us know who calls the shots. Precious girl! I'm so proud of her. Today's test under fluoro did not give enough information to make anyone feel comfortable taking her into surgery at this time. If there is a way to avoid opening her up then they are looking for it. They need to do another test tomorrow under sedation to try and see if the blockage in the bowel can possibly be unobstructed by dilating the loop of bowel. At the same time they will be doing and echo on her heart to get a better picture of what is happening and to make sure there is no bacteria or yeast that have attached themselves to the valves. Ashley was so exhausted after today's procedure that she didn't move for hours after we placed her back in her bed. We decided to put off some things until tomorrow simply because she was just to worn out She slept so hard. There are moments in the day where I become very, very afraid because of her presentation, but then she wakes up and I know she's ok. For today, she's ok. It was a very hard day. I find myself beginning to doubt our decisions and I wonder if we've made the right choices or not. I start to feel panicky and unsure. I hold it all together for a while, but in the darkness with a friend sitting across the room from me I let down the walls and the tears flow without end. My heart hurts so much, so deeply, its raw. Raw from the pain of knowing that we will ultimately lose this battle against her broken body and from the pain of knowing that I can do nothing to stop it. Despite it all Ashley is stable at this time. Yes, her organs are getting tired and they are progressing in the disease process, but none of that is keeping her heart from beating, her lungs from breathing, her kidneys from making urine, her liver from processing...for today. Her vital signs are all rock star status today. She is uncomfortable, but she is not suffering. The team surrounding her is working very hard to make her as well as she can be and their efforts have been amazing. I am so grateful. So eternally grateful. There is so much I could say, but I won't. To those who may doubt the life we are living with her... Just know that every day of her life we have done our very best to take care of her, to love her, and to give her a life worth living for. Never a child has been born that was more wanted or more loved than our sweet Ashley Kate. I want to express how thankful I am for the kind, compassionate, up lifting words that are being sent to us. Your expressions of love and prayers for us overwhelms my heart. Ultimately, I know more than anybody that God will determine the number of her days and that I have no control over that number. She is in His hands and He will receive her when He is ready. I don't decide when that day comes. There is no "letting her go" simply because I am not the one who is holding her. Her creator is. Its been a hard day. We spent today running more tests, more labs, and more consults as we all try to get an idea of what is happening inside of Ashley Kate. Its so very complex and there are so many disciplines involved that the room often felt as though it had a revolving door. At one point I looked up and there 7 doctors in here around her bed all asking us questions about her. Although we are weary from it all, we are so thankful for the efforts being made to figure things out before we jump into decisions that will ultimately become life altering for us all. The most shocking of all findings today has been that Ashley apparently has two loops of small bowel that were not explanted. We had NO idea they were there. Our information and understanding of Ashley's explant came from inside the waiting room as we sat across from her surgeon who had just completed the removal of her bowel and his words fell on exhausted and emotional parents. I don't know if what we came to understand was misinterpreted or misunderstood and all of that doesn't really matter at this point. What does matter is that after today's findings we have been told that Ashley does not have two abscess sites in her abdominal cavity. What she does appear to have is a small bowel obstruction. We are numbed by the findings simply because I never even knew it was a possibility to ever have a small bowel obstruction again. That worry had been eliminated in my mind that night and I've never considered it again. The only way to remove the obstruction is to operate. That means they will have to open Ashley up and re sect the remaining bowel loops. It is so unbelievable. We will have another CT done tomorrow and based on its results will have to decide where we want the surgery to be performed. I won't lie and say I wasn't completely knocked down by this. I was. I could feel my insides shaking at the very thought of opening her back up and operating on the bowel. I'm still shaking. I am hoping for something, anything, to change this course for her. I fear that opening her up is going to be disastrous, but if its found to be an accurate diagnosis then there is no way out. I'm trying not to get ahead of where we are and just wait for the final test results, but as Dave prepares to leave tonight I'm finding it difficult knowing what I will be facing without him here. I don't know what tomorrow holds for us, but it will involve another day of difficult discussions and decisions that once made can not be taken back nor can the consequences of those decisions. There were other discussions about her kidneys, liver, and spleen. We've learned a lot of things I'd wish I would have never needed to know. Its all connected and so as one area begins to struggle the others do too. If I look at the big picture I begin to fall apart. I sat in the dark of the ultra sound room today and cried silently as I stared at the screen. The tears fell and fell. I can not imagine life without her in it. The idea of her being anywhere but home with us is numbing. I'm trying so hard not to fall apart. I simply can't take it all in right now. I'm facing one hour at a time and getting though it the best I can. I want to take her home and listen to her laugh again. I want to see her play and watch her be ornery. I want so desperately to rewind the calendar and be back two, three, four weeks ago. Its beginning to sink in that her life is changing drastically and that we may never have those days again. Still I am so committed to a life of quality. I will do whatever it takes to make her days as happy, as carefree, as painless as I possibly can. This journey has never been easy, but the one thing that has always come easy during it is the loving Ashley Kate part. I love her more and more every minute. She has been the biggest blessing in my life and the greatest teacher of how to live it. I'm praying today's finding were wrong and that tomorrow we will be given different options. I want to take just a few minutes this morning to try and explain just a little bit about where we are and what is going in with Ashley Kate. I very much appreciate the prayers and support each and everyone of you have offered up for us. I will admit that this is a very, very difficult time for us and yesterday was hard, but we have harder days ahead I'm afraid. I did take Ashley in early yesterday morning. So early in fact that I met her doctor in the parking lot of his office! He quickly examined Ash for us and determined that we in fact should do a CT scan as soon as possible of her abdominal area. The CT scan revealed two very large pockets of fluid that had accumulated in the left and right upper quadrants of her abdomen. You may or may not be aware but Ash has a deep incision vertically from her pubic bone up to the top of her rib cage and so if you visualize this as a separation between her left and right side then you can imagine how her torso is divided. She also has a horizontal scar that goes across her lower abdomen and so she's pretty amazing to see! She has large pockets, or abscesses of fluid on both sides right under the diaphragm. After a very long afternoon of working the phones and sitting in the ER we were transported by ambulance to Children's Hospital in Dallas to be taken into surgery to remove these abscesses. We still have not made it to the OR because they are trying to make a determination who best can remove them and how they want to attempt it. It will either be the liver transplant surgeon or general surgery, but our hope is that perhaps Interventional Radiology may be able to step in and drain them. The worst case scenario, and apparently a likely one, is that they have to go in and re open that old transplant incision to access the pockets and remove them. The surgery and recovery would be brutal on her. So much so that I'm not sure we wouldn't lose her to a possible infection while trying to heal from it. There is so much going on at this time in Ashley's little body. If I began to explain or to share I would probably never stop. Just know that she is very, very fragile and her liver is very, very sick. My heart hurts from the many phone conversations and the content of those conversations that we had yesterday. All in all it looks as though we may be at the beginning of the end, and how long we will have before the end comes no one knows. We just know that we are closer than we have been in a very, very long time. After speaking with our transplant team yesterday they feel based on the lab work that Ash has now entered the end stages of liver failure. We have been asked to make some very hard decisions in the next two or three weeks, and I'm not sure that we can make the decisions we are being asked to make. As I shared with Dave yesterday, how do you choose between misery and misery for your child? I don't know how to do this anymore or what is right or what is wrong. I just know that I love her more than my words could ever begin to describe. Ash is stable. Actually her vital signs are all rock solid. However her organ function is not. We've known that for a long time. Her liver, spleen, kidneys, are all very sick and have been taxed by the constant use of antibiotic used to treat re recurring infections in her body. This current infection and the abscesses may have been there for a very, very long time and could be the source of all the infections she's had over the last couple of years. That is a theory that is being thrown around. If that is the case then our hope is that once the fluid is removed that perhaps she may rebound and come back strong continuing to live a life of quality for a while longer. I refuse to enter into the depths of my emotions or the pain that we feel at this time because I'm afraid I'd never stop crying. At least not soon enough to function today as we begin our journey in a new place with a new team of doctors. My heart is broken. Its been broken from the moment I learned she'd been born. Still I wouldn't trade one day of that broken heart because without it I would have had to live my life without her in it. I can't even imagine. I'd ask that when we make it back home, if she's ever able to be at another game or out in our community that you would please not be afraid of her. If you've loved her and been a part of her world up to now, please, please don't let the color of her skin scare you and keep you from approaching her. I will admit that when I see how afraid other people are of her appearance and I see the look of shock in their eyes that it scares me even more than I already am. She's still Ash. She's just a different color and a different size for now. So if you talked to her at the ballpark every week before this setback, please keep talking to her. Thank you for you love, encouragement, and prayers. If you see my big kids today love on them a little bit for me! The details are many, so many that I can't write them at this point, but I ask you to pray. Pray for our sweet Ashley, for us, for her doctors. Please ask anyone you may know of who would pray for her today and in the coming days or weeks to please do so. I'll share more when I can. Thank you so very much for loving my baby.